Each and every one of us spends roughly about a third of our lives asleep. Contrast that with the amount of knowledge most people have about this large chunk of their lives and the result is rather amazing, almost criminal in fact. But that reality leaves you with an incredible opportunity! In less than an hour, you can become more knowledgeable about sleep than 99.9% of the population! While knowledge about sleep is vitally important, we understand that not everyone can become an expert on every facet of the subject. With that in mind, we have created a Sleep Essentials Quick Guide to walk you through the facts and mechanisms of sleep that everyone should know--the essentials of sleep knowledge. If you spend such a large portion of your life sleeping, don't you think you should know a thing or two about sleep? Well, you're in the right place. After progressing through the "Sleep Steps" below you'll be equipped with the knowledge you need to achieve healthy sleep and to optimize your daytime alertness levels and productivity (as well as be able to spout out some pretty awesome facts to your friends). What are you waiting for? Get started now! Note: We are just beginning to launch the Sleep Essentials Quick Guide, so not all segments are currently published. Get a start with the ones below, and check back for more in the near future. 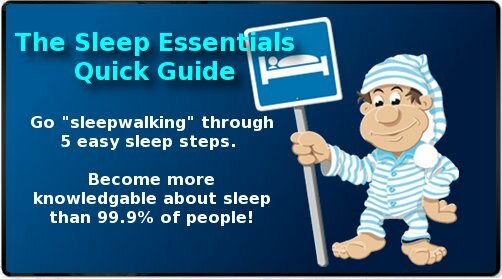 Ready to go "sleepwalking" through our crash course of essential sleep knowledge? Here you will learn vital and practical information about the basics of sleep health, the mechanisms that govern it, and the disorders that thwart it. Sleep Step 1 - The Importance of Sleep - Why learn about sleep and how the knowledge will save your life. Sleep Step 2 - What Is Sleep? - We all sleep every day, so you'd think this would be a simple question to answer, right? Surprising defining characteristics. What Is Lucid Dreaming? Something very, very cool. Learn About It!